If you’re up on your festival buzz, you’ve likely heard about the swarm of ambulances called into the Toronto International Film Festival to extract viewers of the film “Raw” because they had passed out from the gore. A weave about a vegan who develops a taste for human flesh while away at college might do that to you, but what makes the film so visceral and utterly disturbing isn’t so much the blood-and-guts aspect but the cold realization that there’s nothing supernatural going on here (vampires, zombies and lycans, oh my) – just your average waif with an eating disorder that consumes her. And others. The screening I attended passed out barf bags, which was clearly more of a joke/marketing gimmick than a splatter control concern. That was too bad; the film stands on its own, without such hype. Written and directed by first-timer Julia Ducournau, the arty lo-fi production brims with the creepy, slight alter-reality ambience of a Ben Wheatley film (“High Rise” and “Kill List”). We catch up with Justine (Garance Marillier) as she’s being dropped off at veterinary college by her parents. She’s a demure ingenue who doesn’t eat meat (the whole family is vegetarian), so you can only imagine her surprise when dining at the cafeteria she bites into a chunk of sausage nestled inside her mashed potatoes. It’s a bad beginning, but the least of her problems. Before she can even settle in and meet her roommate, Adrien (a lean Rabah Nait Oufella), a hazing party blasts open the door and throws their belongings – mattresses and all – out the window. Subsequently all “rookies” are rounded up and forced to crawl up the stairs of the dorm and to a rave of sorts. For a week, we learn, the newbies are under the thumb of the older students and ritualistically doused with animal blood and forced to eat such dissection orts as rabbit livers. There’s no give for Justine, even with big sister Alexia (Ella Rumpf) as part of the mob. “What’s the big deal, just do it,” she says when Justine balks at the rabbit organ. She ultimately eats it, and soon Justine’s lifting burgers from the cafeteria and consuming raw chicken late at night. At this point “Raw” rides close to the surface, but it’s not until a coughed-up hairball and Brazilian waxing gone awry, leading to the consumption of another’s digit, that Justine and the film tips. Then there’s the matter of Justine’s sexual awakening – yup, she’s a virgin – and her sister’s go-for-broke lifestyle. Marillier pulls off Justine’s transformation with great care, allowing Justine’s seething inner turmoil to boil out through her large, luminous eyes. It’s a performance strangely reminiscent of a young Marion Cotillard in “La Vie en Rose,” and one that earmarks Marillier as talent to keep an eye on. The other revelation here is Rumpf, a dead ringer for Kristen Stewart in “Personal Shopper” – which opens this week too – whose bravado lifts some of the weight from Marillier. The relationships between Justine and Alex is palpably complex, driven by love, compassion and sibling rivalry in school and over boys. It also slowly pulls back the veil on the desire to eat live flesh. In one great scene, Alex demonstrates to Justine how to urinate like a man (standing up). Little sis can’t quite master the task. It’s an uproarious fail that tells us much about the nature of the women and their symbiotic being. And to answer your question: No, I did not need that barf bag, but there was definitely a few look-through-your-parted-fingers moments. Ducournau and her prosthetics and make-up teams go to great ends to make the “raw” look uncomfortably real. The lighting, in-the-moment camera work by Ruben Impens and obscure angles add much to the chilling effect as well, but it’s Marillier that seals the deal. Funny too that this is a French production (it’s subtitled, which can give you a nice looking-away point if you need it). It could that the French are obsessed with people eating people. If not the devilish, post-apocalyptic romp, “Delicatessen” (1991), perhaps Claire Denis’ “Trouble Every Day” (2001) would make a great double bill with “Raw.” It contains one of the grimmest, most disturbing acts on film. Nothing in “Raw” can top it, but “Raw” has an edginess that pervades, an unpredictability that draws and pulls you much in the same way Justine discovers her true gastronomical desires. Good review. 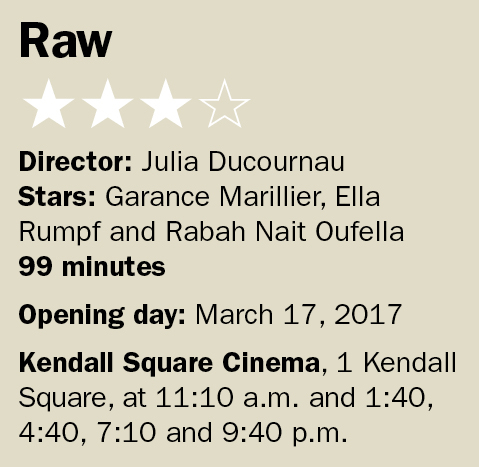 Raw isn’t particularly high on my list of films I want to watch, but it does look interesting.